Designed as a single day plenary format that will allow delegates to participate in the World Science Festival in Brisbane in March on either side, initial program details have gone online here. Program updates are coming in daily and we look forward to hearing any questions you may have, and to seeing you in Brisbane in March! 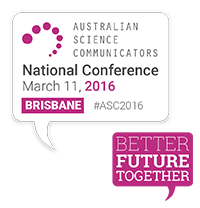 This entry was posted in Conference, Conference, NatConf, National, People, Science journalism by Kali Madden. Bookmark the permalink.